Whether coming to Canada to hit the slopes, unwind by the lake or bring business to life, Residence Inn Mont Tremblant Manoir Labelle offers everything you need to make it happen. 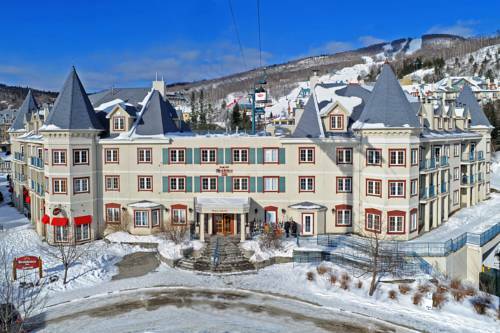 Situated in the heart of Tremblant Pedestrian Village, our hotel places you just steps from premier shopping and dining, as well as acclaimed skiing and snowboarding at Mont-Tremblant Ski Resort. We are also just minutes away from Parc Plage, a lakeside beach perfect for soaking up the sun in the warmer months. Fuel up for your adventures at our free breakfast buffet, then return for lunch or dinner at Casey's Bar and Grill, our on-site restaurant. When it's time to call it a night, retreat to boutique-inspired suites boasting full kitchens, real wood-burning fireplaces and free Wi-Fi. Traveling for work? In addition to our sleek meeting rooms, you'll love our location steps from the conferences happening at Quartier Tremblant - Camp de base. Find the peak of comfort and convenience at Residence Inn Mont Tremblant Manoir Labelle. Casey`s Bar and Grill: Inside our hotel, Casey's Bar and Grill makes a perfect destination for apr s-ski dining. Gather with loved ones and savor classic comfort food, draft beer and specialty cocktails. Room service is available from 11 a.m. to 11 p.m.